This exceptional antique Victorian 15 carat yellow gold and murano glass scent bottle has a plain flask shaped form. This antique glass scent bottle is fitted with a fine and impressive hallmarked yellow gold cylindrical collar and domed cover, which secures with a push fit catch. 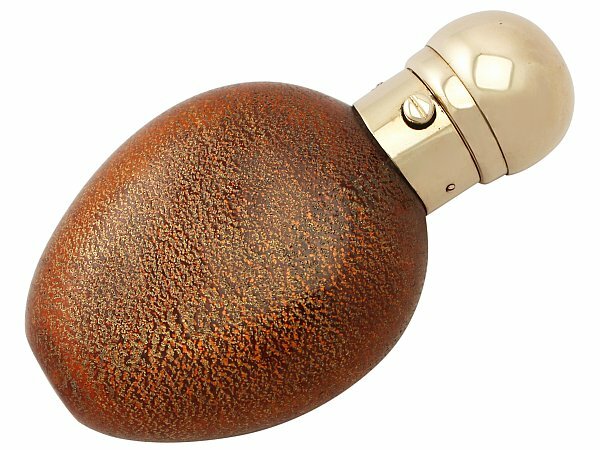 The rounded body of the scent is crafted in persimmon and gold textured murano glass. This antique scent bottle is an exceptional gauge of gold, fine quality and in exceptional presentation condition. Full hallmarks struck to the surface of the collar are all very clear. Reflections in photographs may detract from the true representation of this Victorian item.